* In addition, a free study guide to The Inner Reality was created by Anna Bornstein and PB. When Superman actor Christopher Reeve was asked in a BBC interview which book he would want if stranded on a desert island, he replied, "The Inner Reality by the philosopher Paul Brunton." A provocative and compelling work, The Inner Reality is an essential guide for spiritual seekers. First published in the 1930s, this remarkable book interweaves the teachings of two great religious figures: Jesus and Krishna. Identifying a common current running through both Christianity and Hinduism, Paul Brunton describes how an "inner reality" or "kingdom of heaven" can be found within each of us. Defining religion as simply the practice of binding oneself with divinity, he encourages readers to embark on the quest for self-knowledge and spiritual communion through a commitment to the contemplative path and practices explained in this book. With his profound interpretations of the wold's sacred texts, from the Gospel of St. John to the Bhagavad Gita, Brunton bridges East and West to guide the reader into the living heart of these ancient traditions. This new edition has been updated to incorporate the author's final revisions and includes a foreword by the Paul Brunton Philosophic Foundation. You can read a short excerpt from the chapter "What Is God?" on the publisher's website. This beautifully illustrated deluxe edition allows you to see what PB saw (sometimes from his own camera!) and literally walk where he walked among the streets of Cairo and the ruins of Karnak. An essential book for anyone interested in understanding the truth of Ancient Egypt. Along the way,Brunton meets a variety of occultists, fakirs, dervishes and an adept, and even manages to become initiated into the deadly art of snake charming. His frank interviews with Muslim leaders are relevant today, and his description of the Hajj reflects the beauty and inspiring faith of Muhammad's true followers. This new, updated edition includes additional images from PB's collection, as well as the text corrections that he gave us at the end of his life. "Any serious man or woman in search of spiritual ideas will find a surprising challenge and an authentic source of inspiration and intellectual nourishment in the writings of Paul Brunton." —Jacob Needleman, author of What Is God? The Secret Path opens with an exquisite description of being in the presence of a sage—PB shares his deep experiences and his profound connection and appreciation for the teachings and teachers of the East. From this mystical opening, he begins his presentation of the fundamental teachings and practices of the spiritual quest. While this is a book of mystical/meditative instruction for spiritual self-discovery, it is also written for people living in the contemporary West. PB provides direct, clear, and viable practices for meditation, relaxation, the development of intuition, and the discovery of our higher self—all applicable to the active lifestyle of urban dwellers. He did not want to waste people's time by requiring them to learn the outmoded vocabulary of ancient texts, preferring instead to transform the truths buried there into their essence, stripped of nomenclature and freed from unnecessary ritualism. Since its first publication, the pace of life has only increased, and the opportunity for introspection has further diminished. The Secret Path, its message and methods, are ever more essential to achieve deep sanity, balance, and the benefits of a rich inner life. The classic work on seeking a guru. This is PB's most famous and often-read book. It is indeed a search in India and holds the secret of spiritual seeking. The text is a modified account of PB's earliest trips to India, combining his earliest impressions with his later reflections on his experiences there. PB describes himself here as a spiritual seeker trying to find a teacher and trying to decide if he wants or needs one. This search is the core of the book, motivating him to travel across the length and breadth of India interviewing known and unknown, named and unnamed yogis, fakirs, and gurus. Among the individuals PB describes, two stand out: first the remarkable sage Ramana Maharshi, who was regarded by all who met him as an enlightened being and remained free of any controversy throughout his life. In these pages PB presents an inspiring account of the sage's life and introduces us to his essential teachings as well. PB spent a great deal of time with Ramana and is credited with bringing this great Teacher to the attention of Western seekers. The other individual that PB met was Sri Shankaracarya; here he tells us something of the background and mission of His Holiness and provides us with a record of their earliest interview, which remains poignantly relevant to today's seekers and today's world. Finally, the most important aspect of this book is its function as the archetypal blueprint of the quest for a spiritual teacher—be it in India, Ohio, or in one's own heart. PB presents us with a compendium of all the problems and opportunities such a search must encounter. These include the issue of dealing with over-eager disciples who may be well-disguised messengers of truth or mere fanatics; the challenge of differentiating the public image of a popular guru from the truth-or falsity-of the man himself; the experience of opportunely meeting a genuine teacher, only to find that he or she is not one's own teacher; and finally, there is the fundamental battle within oneself as to whether or not to accept a teacher, much less to do this whole spiritual quest thing in the first place! PB does not present us with pat answers, but he does provide us with ways to approach each of these facets of our search and methods that will leave our independence intact, our aspiration renewed, and our yearning deepened. This is the most lyrical, mystical, and personal of all his published writings. It provides a way-station between the first phase of PB's writings, which are largely introductory, and his subsequent phase which culminates in The Hidden Teaching Beyond Yoga and The Wisdom of the Overself—these take us into the depths of mystical philosophy. Before we begin that task, we are invited to retreat a while, and plumb the depths of our own hearts with Nature as our guide and companion. For it is here that we find PB's record of his own journey into his Overself, a journey that is mirrored by his trek into the high Himalayas, his isolation there, and his reflections on the world below. Scattered among the anecdotes of his travels and visitors, PB examines the world situation and extracts their philosophic lessons. While the events themselves are long gone, their likenesses (war, politics, fame, and infamy) are very present with us today. For example, one chapter is titled "On Philosophy and Fun-Reflections on Mr. Charles Chaplin—His Silent Art and Genius;" and while Mr. Chaplin is no more, his is an ever recurring role in our popular consciousness. Such is PB's skill as an author that we find his observations of these events and personalities fresh and useful. Alongside these musings, PB encounters with various visitors to his high camp, bringing with them interesting interludes of spiritual conversation and anecdotes of their own adventures. Even so, this book is as much or more about Nature has to teach us than Humankind. He befriends a fly, studies meditation from an ancient tree, and confronts a hunting panther, all with equal curiosity and poise. His descriptions of the surrounding mountains and their denizens is at once inspired and inspiring—stimulating us to seek our own communion with Nature and trek into her hidden, sacred places. Like the Chinese Mountain Sage Han Shan, PB focuses on the ordinary things of life, and, as the outer world diminishes in its importance, takes us a little way into ourselves as he withdraws deeper and deeper into himself. The Quest of the Overself explains how to engage in meditation practices and mental exercises, describes the Overself as our true self, and outlines a specific approach to the spiritual quest. At the outset PB explains that he has chosen the term Overself to refer to our soul, our higher self because he wants us to start fresh as we ask the question, "What exactly is this deeper 'I' within me?" He provides the practitioner with the methods of meditation and self-inquiry needed to answer this question for his or herself—and to thereby achieve self-realization. The book is divided into two Parts: "The Analyses" and "The Practices." In Part One, PB analyzes the physical, emotional, and intellectual self, focusing on the spiritual development that takes place with each. This section is a thorough and accurate expansion of Sri Ramana Maharshi's "Who Am I?" exercise, and if put into practice, will provide the seeker with the direct mystical experience of the "answer" to this inquiry. In Part Two, PB balances the effort of inquiry with that of developing and maturing the very aspects of our person from which we aim to become detached. This second phase is the crucial difference between mysticism and philosophy, between those who seek spiritual development for themselves alone and those who are preparing to share the fruit of their labors with humankind. To this end PB provides instruction for emotional refinement, mental mastery, the path of self-inquiry, and addresses mysteries of the breath, eye, heart, and Overself. The final chapters describe the extraordinary power and presence of the Overself, its practical intuitional guidance, and its sacred residence within our hearts. In later years, PB said that one could realize the Overself through reliance on the techniques incorporated in this book alone. Definitive editions of The Hidden Teaching Beyond Yoga & The Wisdom of the Overself have now been republished by North Atlantic Books in Berkeley, California. These updated editions contain all the changes and corrections made by Paul Brunton before his death as well as relevant quotes from The Notebooks of Paul Brunton that provide additional material for understanding these texts. When PB wrote these two books, he intended for them to be two volumes of a single work but prior treatments made them seem separate. We have now been able to have them designed as a pair and give them the singular subtitle: The Path to Self-Realization and Philosophic Insight, v.1 & 2. Inspired by his time spent with sages in Asia in the 1930s, Paul Brunton wrote The Hidden Teaching Beyond Yoga (volume 1) and The Wisdom of the Overself (volume 2) to fulfill the request of these remarkable teachers who recognized that Brunton had a significant role to play in the transmission of traditional wisdom to the West. Here is a profound re-creation of these teachings, brought to life and made accessible by the brilliance of Brunton's insights. Clearly written, the books speak directly to the contemporary spiritual seeker. This new edition has been updated to incorporate the author's final revisions. It includes a new introduction plus supplementary reading material selected from the author's archives by the Paul Brunton Philosophic Foundation. Inspired by his time spent with sages in Asia in the 1930s, Paul Brunton wrote The Hidden Teaching Beyond Yoga (volume 1) and The Wisdom of the Overself (volume 2) to fulfill the request of these remarkable teachers who recognized that Brunton had a significant role to play in the transmission of traditional wisdom to the West. Here is a profound re-creation of these teachings, brought to life and made accessible by Brunton's insights. In print since the 1940s, they are considered to be among the most comprehensive, clear, and practical guides on the path to enlightenment. This new edition has been updated to incorporate the author's final revisions. It includes a new foreword plus supplementary reading material selected from the author's archives by the Paul Brunton Philosophic Foundation. Here is an excerpt posted on the publishers' website where PB explains the law of karma. As the twenty-first century unfolds, our world faces dire political, ethical, ecological, and spiritual challenges on a global scale. How are we to understand the crises that are affecting us all? 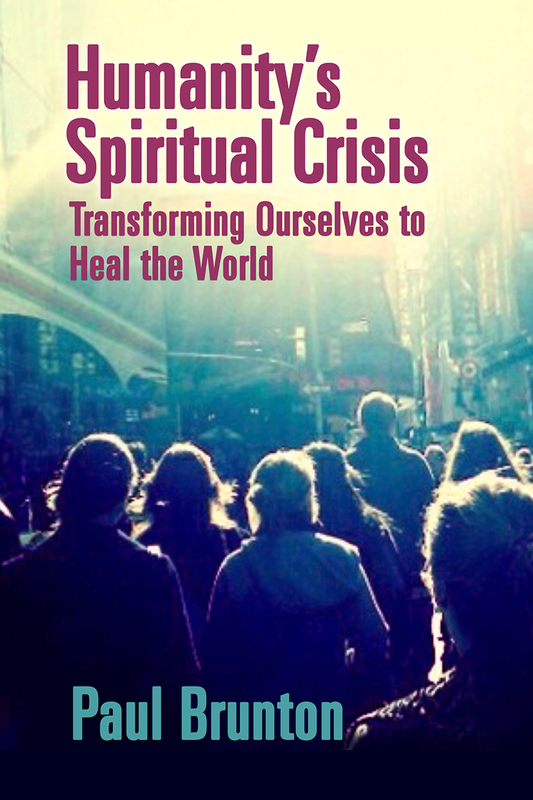 Paul Brunton’s Humanity's Spiritual Crisis spells out how the nature of today's widespread, confusing, and many-layered crisis is essentially a spiritual one—and one that we ignore to our peril—we must undertake a major step forward in our evolution as a species. He provides a deeply informed framework of spiritual understanding and practices that help us find the most effective and creative ways to address these momentous situations in our daily lives. Brunton was well aware of the potential for disaster in the contemporary world. He had witnessed the two world wars and recognized the increasing danger of a nuclear holocaust. First appearing in 1952, Humanity's Spiritual Crisis, offers the only sure way to heal our society, and our planet—by awakening enough individuals to transform themselves and their world. Humanity's Spiritual Crisis makes it clear that we cannot build a new and better world until we have looked within, found the soul's light to guide us, and made unavoidable inner changes. We may consciously co-operate with the inner purpose of this crisis and intelligently participate in it to our own benefit. If, however, we blindly resist or lazily delay, we will suffer the consequences.